Finalize document(s) and notarize; you now have everything you need. B.C. Notaries are proud members of a select group of legal professionals commissioned for life by the Supreme Court of British Columbia. They differ from Notaries in other jurisdictions in that their scope of practice is much broader and more extensive than Notaries in other provinces across Canada (with the exception of Quebec Notaries). B.C. Notaries are trained in non-contentious legal matters, specializing in preparing documents that define and protect your interests in property. 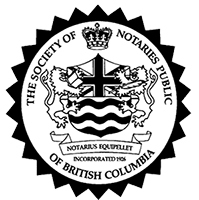 B.C Notaries do not argue cases before a judge and do not appear in court. Their role is to act as facilitators, committed to properly preparing and registering your legal documents. B.C. Notaries have long been recognized by the public for their integrity and honesty. Our membership comprises approachable professionals who specialize in land law and estate planning documentation. This refined scope of practice means that Notaries are experts in their fields; they have vast knowledge of legal theory and legislation but also – importantly – they know how to practically apply and tailor their knowledge to meet the specific needs of their clients. Why Choose Donna Van Beek Notary Corporation? Buying a house marks a life milestone; likewise, the decision to make a Will often results from a major life change or event. Although exciting, we understand that, for many people, making these types of decisions can also be quite overwhelming and, even, downright daunting. So, we’ve made it our mission to help! We provide efficient service, clear direction and helpful guidance in a relaxed setting. We will be your advocate and will promise you fair, honest service and valuable advice. We don’t take your trust for granted, so we want you to feel comfortable with us and with your legal process. This is why we don’t just prepare and register your documents – we strive to ensure that you fully comprehend all documents that you sign with us and that you understand what your legal process will entail. Our clients have appreciatively declared their interactions with us to be “completely painless,” easy and enjoyable, which is why they keep coming back! Experience tells us that no two clients are the same. Our dynamic firm is prepared for diverse circumstances and new challenges. I’ve not had great experiences with notary’s in general but I have to say the folks at Donna Van Beek’s office in Langley are fantastic. Called yesterday, appointment today and all I needed done was done quickly and efficiently. Cathe was my first contact and she was superb! Kelsey, one of the on-staff notaries followed that up with a fast set of signatures and I was on my way. That’s how it should be done!! Thank you! Our family has been with Donna VanBeek and her staff for many years! They’re amazing people – BIG hearted, fun, and skilled. I can only think that any poor review says more about the reviewer than about Ms. VanBeek or her staff. We’ve done wills, conveyancing and more. They are always professional and yet make you feel like family. We’ve referred our family and friends and all report feeling that they are in very good hands. Great service by Donna and her staff. My husband and I did our wills with Donna and some mortgage legalities. She was extremely helpful and full of insight. She covered areas for our wills that I had not thought of. Wondeful experience. Donna and her staff are great. Donna has a great sense of humour which makes things fun. I highly recommend for any needs.